This aquatic amusement park is the ideal place to go with friends or family, and enjoy a nice sunny day and loads of fun in the water. A slide of over 40 metres with bends and curves, in which you ride on a rubber ring. Padded slides that gives the feeling of flying on the water. A ride on large rubber rings. A steep slide of about 15 metres high in which you reach great speed on the way down. A pool to swim and relax with small waves that simulate the sea. A swimming pool with colourful slides for the children. A children’s ride with squirting water and an oasis in the middle. An artificial lake to enjoy with your friends or family. A bubbly Jacuzzi ideal to relax. The information regarding the prices and opening hours are of 2012, although it’s very likely that the information will remain correct, it may have varied. The prices have 40% discount if you access the park as from 3pm except in high season (July-August) which is as from 4pm. 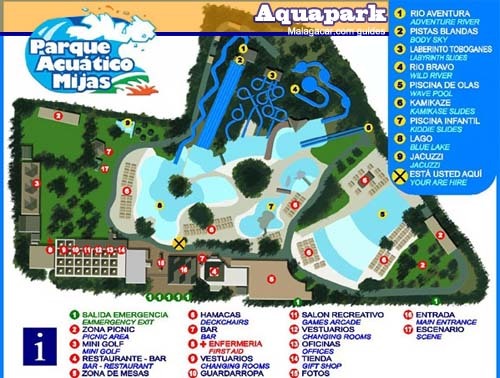 The park has several offers that are updated each year, we recommend you to visit the Mijas Aqua Park’s website to check them out. Mijas Aqua Park has a bar, self-service restaurant for 9,50€, pizzas, drinks and Ice creams. There is a life guard service, permanent first aid, lockers with individual key, changing rooms and showers, sunbeds, shady areas and information desks. If you get tired of the water, you can play a game of crazy golf or climb up the rock-climbing wall in the park. If you go by car, the clients have free parking just outside the park.